Finish your game. Finish your game. Finish your game. Stop procrastinating and finish it. The act of creation can be exciting and a struggle but if you don't finish it, you'll never know if it was any fun to play. Publishing is what you do once you have finished. So finish it. If you're not sure if you're finished then that's OK. I have put together a guide to help you answer the question. As a philanthropist, you do not need to wait until the game is finished before you share it with the community. By sharing early, you can draw upon the experience and knowledge of other philanthropists keen to share their knowledge. By releasing small and often, you reduce the cliff of work you need to scale before the joy of releasing. If you are having trouble finishing a large project, then release what you have. Be prepared for raw feedback early and then turn round a new version quickly. Do not dwell, sort out the problems and release again. Licensing is very important. You might think that giving something away for free is simple but you could leave yourself open to problems if you do not slap on a license. For example, without a licence printed somewhere, print shops might not allow a prospective GM to print it! Furthermore, if you don't add a little protection, then you might find someone selling your game. Licensing is a personal and legal choice I am not qualified to assist you with, however I can recommend giving it a Creative Commons license. Creative Commons allows you to tailor your license to your needs and gives you a handy graphic that is rapidly becoming a standard. Most game designers choose BY-NC-SA, which means "Attribution, Non-Commercial, Share-alike". Creative Commons do a great job of explaining how they are used. Uploading your game serves two purposes: sharing with others and backing up. When you back up, do not forget to back up the resulting PDF and the source files, images and notes. There are lots of places you can put your game for people to enjoy. If you are releasing small and often, you will want somewhere easy to update and accessible to all. If you have finished, you will want somewhere with exposure. Google Docs allows you to upload PDFs and ZIP files. There is plenty of space and you can keep revisions too. Privacy settings allow you to use it as a backup too. Skydrive is the Microsoft solution, plenty of space and privacy options. Dropbox cleverly automatically synchronises your files to the server. Ideal for backups and can share too. 1KM1KT 1000 Monkeys, 1000 Typewriters, the best free RPG community. 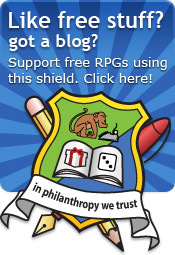 RPGNow and DriveThru RPG are commercial sellers that will also host your free game for you. Lulu is a service that offers print on demand. I recommend printing at least one for yourself because it is a joyous moment to see your creation in hard copy. Ask on the 1KM1KT forum for a review. Tell the Reddit Community, they like free stuff. RPG.net (the big purple) have an Ads and Open Promo forum that's worthwhile. Enworld has a lively comunity but make sure you're posting in the right place. They've changed their policy on promo posts in the past, so have a good look before you accidentally annoy anyone. Update your signatures on forums to link to it. Tweet it, Google+ it, slap it on Facebook. Be proud of it, you've worked hard. Chances are a huge hole has been left by the completion of the game. Starting the process again for a new game might feel daunting so instead, support your game. Support is the act of engaging with the community to promote its play. Supporting your game will give it longevity not only in the eyes of the world but for you too. Start a blog, posting up characters, rule options, new adventure ideas and people's feedback. Most use either Blogger or Wordpress. Add Google Analytics to your blog so that you can see where people are coming from. It is really handy to see if someone blogs about your game so you can then reply - with thanks! Create a Google+ Page for your game. Use a nice graphic for the logo. If you're really keen on regular updates, create a Facebook page and Twitter account. Make sure they're used, though! If it is a generic system, write another setting for it. Find other free games like yours and contact the authors. Finally, let me know if you found my guide helpful! Thank you. One of the most coherent guides of this sort I have read, including those contained within publications I had to pay for. I know I've mentioned this before but it bears repeating. Releasing early is kind of nerve wracking in that you're presenting something incomplete to an audience. It's important to grab readers with a small, easily encapsulated vision of the game and then add on to it when you've got them hooked. A lot of writers think that the broader their concept the more potential people will see in it. Unfortunately it doesn't work that way. Start with a focus on the coolest thing you can imagine doing in your game and move on from there adding on. Start small but focused. Start with the best and fill in the rest. Nice Rob, I'm impressed with the work you've put into this guide. I second getting your own Lulu copy no matter your other plans. It's a rush and makes all the work worth it by itself. Thank you Ulfgar - if you're still alive by the end of that, please let me know how you got on! Thanks for a really comprehensive guide to creating you own RPG. It's very useful. What lovely timing, as I spent the better part of the weekend shaking the dust off my own homebrew. About your Free RPG Directory, it could use some updating. For instance, the Shakhan RPG link leads to a 404 page now. i readed those articles a little bit late because i already wrote a role playing game! But they were a really interesting reading. Hi Rob. Very nice post here with some great points! I'd be interested to see what you think. I also really like the idea of presenting the work in its incomplete state and I think I just may do that for my next "rpg conversion." @mythusmage - Thanks for the headsup. I'll make use of delicious's tools for finding the dead links. @TheRPGGuy - I have a huge backlog at the moment, I'll be sure to add yours in too. Don't forget to pop along to 1km1kt.net if you need a quicker opinion! I wonder if you might put this guide series into a PDF? Trying to read through it here, I have to read the page from bottom to top, and it gets trippy. I ditto the request for a PDF copy. thanks for the Guide! Please, for the love of all that is holy, pull this series into a PDF so I can hand it to my students. Thanks for the support. PDF guide is slow going but will be coming. Hi Rob - Was wondering if you ever put this fantastic guide together in a PDF? Thanks!